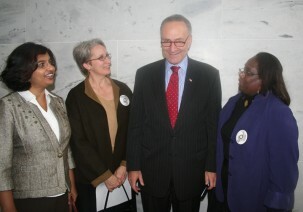 Sen. Schumer listened to climate activists Rajyashri Waghray (CWS), Christina Herman (Oblate Justice, Peace/Integrity of Creation), Esmeralda Brown, (UMC) after they delivered Countdown to Copenhagen postcards to his legislative aide. The Oblate JPIC Office joined other faith groups and denominations on November 4th, in sponsoring a climate vigil focused on the justice dimensions of climate change. The Climate Vigil, followed by Senate visits, was organized by Church World Service, the National Council of Churches and United Methodist Women. Faith groups have been emphasizing the need to focus on the impacts of climate change on the poor, particularly those in developing countries, who are most affected yet who bear the least responsibility. A Senate bill approved by the Senate Environment and Public Works Committee would require industry to make a 20 percent cut from 2005 emissions levels for carbon dioxide and other greenhouse gases by 2020. The bill is expected to go to the Senate floor early next year. The churches are also concerned that the US carry a strong position to rein in climate change when countries meet to set targets in Copenhagen in December. Church World Service has spearheaded a yearlong Countdown to Copenhagen sign-on campaign in the US. World leaders will try to agree on a plan in Copenhagen to extend the Kyoto Protocol climate change agreement. The United States has not yet signed on to the Kyoto Protocol, yet the pressure is on to take action soon. Scientists have recently predicted that inaction in reining in rising temperatures from global warming will result in huge economic and social costs, highlighting the need for all countries to shift away from carbon-intensive forms of energy production.